Graham Linehan’s hit adaptation of the classic 1955 Ealing comedy The Ladykillers, directed by Sean Foley will embark on a 26 week tour coming to the Theatre Royal, Glasgow on Monday 19th November. Tickets for this unmissable production go on sale on Friday 15th June. The Ladykillers tells the story of the eccentric little old lady Mrs Wilberforce who lives alone with her parrot in a strange lopsided house in King’s Cross. Her life is turned upside down by the arrival of Professor Marcus and his four friends, who between them make up the most unlikely group of criminals. Planning the heist of a security van, they decide to use Mrs Wilberforce as cover and involve her unwittingly in the plot. Things do not go well and the Professor’s plan starts to unravel in spectacular and hilarious fashion. This stage production of The Ladykillers has been adapted by Graham Linehan, best known for being the writer behind TV comedies Father Ted and The I.T. Crowd. Director Sean Foley is a multi-award winning stage director whose work in the West End includes Play What I Wrote, Do You Come Here Often, Ducktastic, Pinter’s People and Joe Orton’s What The Butler Saw. Paul Bown plays Professor Marcus. Paul’s theatre credits include; Deliverance/Liberation, When We Are Married, Round and Round the Garden, On the Piste and The Alchemist. Television credits include; Doctors, Holby City, My Family and The Bill. Clive Mantle plays Major Courtney. His numerous television credits include Little John in Robin Of Sherwood and consultant Mike Barrett in Casualty and Holby City. More recently Clive appeared in Game Of Thrones. The Olivier nominated actor has also starred in various theatre productions on tour and in the West End including; The Price, A Streetcar Named Desire, Robin Hood, Educating Rita, The Play What I Wrote, Killing Castro and The Rocky Horror Show. Chris McCalphy plays One-Round. Recent theatre credits include; The Madness of George III on tour and in the West End, When We Are Married, Enjoy, YouCan’t Take It with You and The Letter. TV credits include Five Daughters, Casualty and The Giblet Boys. Chris has also narrated various Natural History films for the BBC and The Discovery Channel as well as Voiceovers for Channel 4, BBC1, BBC2, BBC3, Aardman Animations and Radio 4. William Troughton plays Harry. He was part of the original West End cast of The Ladykillers, understudying the role of Harry and Louis. William’s previous theatre credits include the Woman in Black, The Holly And The Ivy, Getting On, Busted and My England. He has also appeared in films War House and Changing the Subject. William is the third generation of actors from the Troughton dynasty, with Patrick Troughton (the second Doctor Who) being his grandfather. Shaun Williamson plays Louis. He starred as Barry Evans in the BBC’s EastEnders for almost a decade and has appeared in The Bill, Holby City, Inspector Morse and two series of the BBC’s acclaimed Ricky Gervais comedy Extras. Shaun made his West End debut as DJ Monty in Saturday Night Fever before reprising the role on tour. Further theatre credits include; Guys and Dolls, The Rocky Horror Show, Never Forget and Porridge. Michele Dotrice plays Mrs Wilberforce. Michele is perhaps best known for her role as Betty, the long-suffering wife of Frank Spencer, played by Michael Crawford, in the BBC's highly successful series Some Mothers Do 'Ave 'Em. Her other television credits include; A Month in the Country, The Winslow Boy, The Way We Live Now, Marple, A Thing Called Love and a guest appearance on the Morecambe and Wise Show. Michele’s most recent stage appearance was in When We Are Married at the Garrick Theatre, London. She also appeared in many productions with her late husband, Edward Woodward including Male of the Species, Richard III, Private Lives, Dead Secret, The Assassin, The Beggar's Opera and The Cemetery Club. 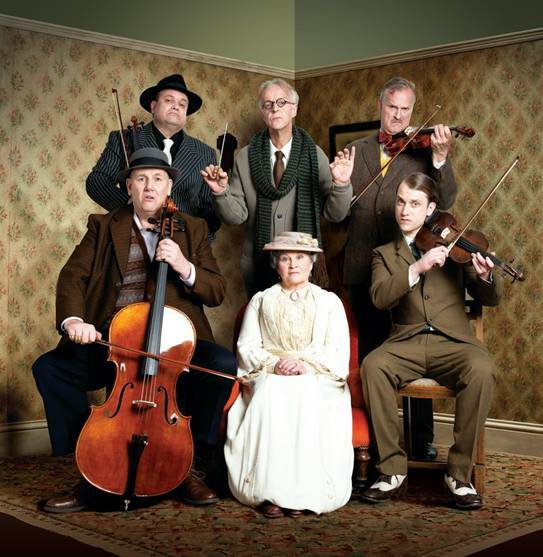 The UK and Ireland tour of The Ladykillers follows the critically acclaimed West End run at London’s Gielgud Theatre. The production was nominated for five awards in the 2012 Laurence Olivier Awards, including Best New Play, Best Direction, Best Set Design, Best Sound Design and Best Actress in a Play for Marcia Warren. The play smashed all known box office records at the Gielgud Theatre, by taking just under £400,000 in a single week between Monday December 26th and Sunday January 1st 2012 and recouping its entire West End outlay in less than seven weeks.